And so it was that Gail Simone, having conquered the sales charts with her newly revamped Red Sonja title, decided to share the bounty of her questing with her fellow Valkyries. Hither come Legends of Red Sonja - an anthology book written entirely by female writers. Some of them experienced comic writers. Some of them experienced writers in other media. All of them having a deep respect for The She-Devil of Hyrkania. Let me tell you of the book of high adventure! The introduction of the book provides us with our first exposure to a mercenary band known as The Grey Riders. Some of their number hunt for Red Sonja in the name of justice. Some of them hunt her for the price on her head. Still others seek revenge, having been wronged by Red Sonja personally in the past. Gail Simone writes this frame story and slowly sets about exposing us to the various members of the Grey Riders with her usual humor. 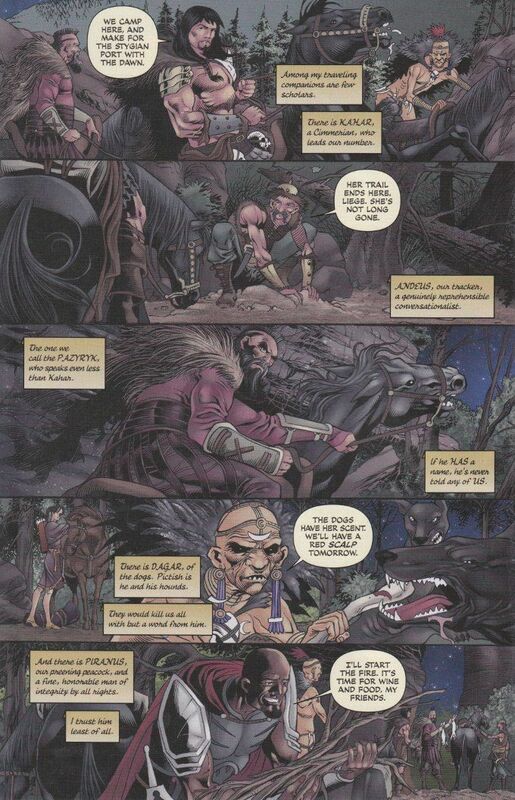 Jack Jadson, most recently seen on the Red Sonja: Unchained mini-series, illustrates these scenes with the same level of skill and detail he showed there. Horror author Nancy A. Collins writes the first chapter of the issue - a tale told by the Stygian priest/assassin Eles about his own reasons for seeking out Red Sonja.. Set at an early point in Sonja's career, this story details Sonja's efforts to steal from a Stygian temple. Naturally, things don't go according to plan and Sonja must fight her way past the temple's many guardians. The story is fairly standard as far as Red Sonja stories go but it is enjoyable nonetheless and ably illustrated by Noah Salonga. The final chapter by Devin Grayson is the weakest point of the issue, but it is also by no means unenjoyable. Told from the viewpoint of a ship's captain who The Grey Riders question about Sonja's whereabouts, the tale is a long and rambling affair. Indeed, more attention is paid to an unnamed sorceress than Sonja, who must fight the monster that said sorceress summons. Thankfully, the action is engaging once it finally begins and the artwork of Carla Speed McNeil conveys that action quite well. Overall, this series is a worthy contribution to the the Red Sonja oeuvre. Fans of Simone's current Red Sonja title as well as sword and sorcery in general would do well to pick this book up. It's a great read.